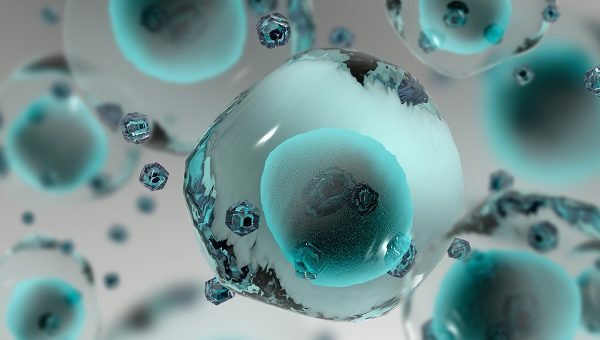 The nanomedicines market is worth billions and, despite a variety of hurdles, it continues to attract the attention of venture capitalists. Tarun Pandotra reviews developments in the sector. Nanotechnology has come a long way in the last five years and now nanomedicine, a marriage of nanotechnology and medicine, is taking its place in the fight against unmet diseases. With the promise of medical applications such as targeted cancer treatments, microscopic sensors and even devices that mimic human organs in the future, enthusiasm for the field is backed by serious research and development funding from government and industry. The US accounts for a third of all publications, and half of patent filings, in nanomedicine research. A comparison with Europe shows that, while Europe is at the forefront of research, the US leads on the number of patent filings, indicating its more advanced commercialisation. 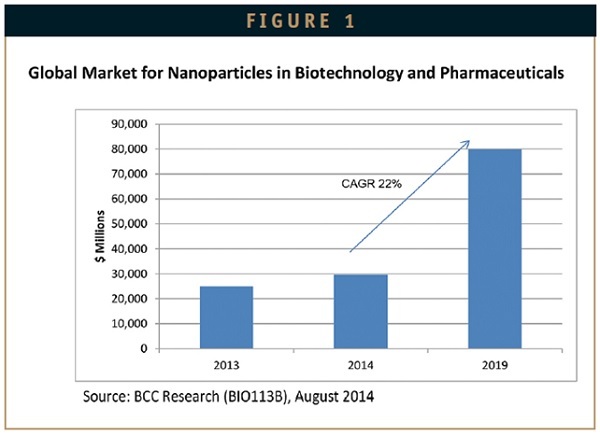 According to the BCC Research report ‘Nanoparticles in Biotechnology, Drug Development and Drug Delivery’, the global market for nanoparticles in the life sciences was estimated at over $29.6 billion for 2014. This market is forecast to grow to more than $79.8 billion by 2019, resulting in a healthy compound annual growth rate (CAGR) of 22% (Figure 1), with the biggest increase likely to be seen in the area of drug delivery systems. As products complete clinical trials and gain US FDA market approval, the revenues from these products will grow at 23%. Basic biotechnology research revenues will increase in the drive to find more nanoparticle applications, as more drugs are delivered successfully by these carrier systems. Drug development and formulation will show steady sustained growth at 20.7%. Nanoparticles for use in diagnostic imaging will continue to show healthy growth at 20.1%. This will result from the need to develop more definitive nanoparticle markets for disease diagnosis. The report states that, despite the 2008-2009 financial crisis, the global nanomedicine sector, worth $53 billion in 2009, was projected to grow at a CAGR of 13.5%, surpassing $100 billion in 2014. One of the largest segments of this market is represented by anticancer products. Valued about $20 billion in 2009, it was expected to reach $33 billion in 2014, growing at a CAGR of 11%. Of the approximately 200 companies active in nanomedicine currently, three-quarters are startups and SMEs. Nano-enabled medical products began appearing on the market over a decade ago, with some now best-sellers in their therapeutic categories. The main areas of impact are cancer, central nervous system (CNS) diseases, cardiovascular disease and infection control. Cancer products include Abraxane, Depocyt, Oncospar, Doxil, and Neulasta. This therapy area is a prime focus for nanopharmaceutical R&D, and companies with clinical-stage developments in this field include Celgene, Access, Camurus, and CytImmune. Treatments for CNS disorders, including Alzheimer’s disease and stroke, feature prominently in nanotherapeutic research, seeking to build on the achievements of products such as Tysabri, Copaxone and Diprivan. According to the BCC Research report, this is a field hungry for successful therapeutic advances and annual growth from existing and advanced pipeline products is expected to reach 16% by 2019. Autoimmune-related inflammatory disease has an increasingly high profile, and nanotechnology has contributed to the success of products such as Remicade and Humira. Enzon is among companies pushing development in this field, and new products are expected to add to the market penetration of existing therapies, contributing to annual growth rates of around 15%. In addition, nanotechnology has contributed to a wide variety of anti-infective products, from pegylated interferons, used in viral disease, to nanocrystalline silver, used topically in wound infections. BioSante and NanoBio are actively involved in this field. The US market is by far the largest in global nanomedicine. While it is set to continue its dominance, other national markets are expected to increase their shares over the next few years. In 2007 investment in nanotechnology by venture capitalists (VCs) was $702 million, across 61 deals. Of these, 27% went to healthcare and life science, 31% to energy and environment, and 42% to electronics and IT. Two years later, the nanotechnology market captured $792 million in VC investment, with the largest share (51%) going to healthcare and life sciences. This doubling of the funds invested in healthcare in such a short period demonstrates investor interest in nanomedicine. A lack of explicit legal and regulatory guidelines, coupled with long approval procedures, makes nanomedicine products harder to develop than nanotechnologies in other industries. As a consequence, the high expenditure needed to bring a nanomedical product to the market forces companies to focus on blockbusters. It is reasonable to presume that nanomaterials are ‘new for safety evaluations purposes’ and therefore merit careful oversight by regulators, both before and after entering the marketplace. Nanotechnology is being used more widely in a new generation of drug delivery systems. Nanoscale particles have a greater surface-to-volume ratio than macroparticles, so a drug-bearing nanoparticle can release a drug more quickly and abundantly. This is helpful when the drug poses problems with solubility and absorption, as is the case with a considerable proportion of new drugs. Already on the market in the US and elsewhere are wound dressings with the antimicrobial properties of nanocrystalline silver. Ionic silver is a powerful antibacterial, even effective against MRSA, and incorporating nanotechnology in a wound dressing optimises its effect. Regarding anti-cancer products, Doxil and Abraxane are examples of success. Sequus Pharmaceuticals was the first company to sell Doxil, the liposomal formulation of Doxorubicin, a powerful but toxic chemotherapeutic, initially approved for treatment of Kaposi’s sarcoma in the US in 1995. Sequus was acquired by ALZA Pharmaceutical for $580 million in 1998, which subsequently merged with Johnson and Johnson in 2001 in a $12.3 billion deal. The other approved nanotherapeutic agent, Abraxane, was originally sold by Abraxis Biosciences, which was acquired in June 2010 by Celgene Corporation for $2.9 billion. Granted via orphan drug designation in January 2005 by the FDA, this product consists of albumin nanoparticles containing paclitaxel, and is indicated for the treatment of breast cancer. Conventional chemotherapies consist of injections of cytotoxic drug intravenously, which kill both healthy and tumour cells indiscriminately. The clinic success of Doxil and Abraxane was driven by their ability to target tumours directly, because of the gaps (endothelial fenestrations) in the blood vessels supplying the cancerous mass. Nanoparticles of the right size can penetrate these ‘gates’ and diffuse passively into the tumours. This generation of chemotherapies means patients are benefitting from new treatment strategies for delivering drugs through nanotechnology carriers with lower systemic toxicity and improved therapeutic efficacy. Despite the issues nanomedicine still faces, investment in this market is set to increase. New applications have demonstrated its value, and the resulting expansion of potential markets makes the risk more appealing. The financial collapse, elevated costs associated with the R&D process, tricky access to funds, uncertainty over expected returns, and the lengthy FDA regulatory process have not deterred investors. Despite the problems, the potential of future developments in the different market segments, and possible high returns from high-risk innovation investments, make this market highly attractive. The fact that in 2009 VCs doubled their investment in nanomedicine, at the expenses of the IT market, and that it continues to dominate VC funding in the healthcare market suggests it has a bright and expanding future. Tarun Pandotra is Director and Founder of Global Regulatory & Consumer Insights. He has 20 years’ experience in drug development. He focuses on regulatory mechanisms and innovative approaches to drug development, to bring new technologies to patients. 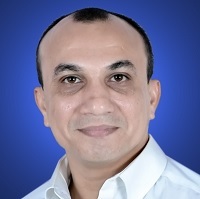 Previously he was a director with PRA Health Sciences, managing clinical operations in SE Asia and India. Prior to that he was a Global Project Manager with PPD.